Do you have a big New Year’s resolution for 2017? A list of them? I’ve never been one for making them, but I’ve decided to change that this year thanks to some prodding. We’ll get to that in a minute. But first, here’s a related question: What do the 8 of Swords card in a Tarot deck and a romance writer staring at a blank Google document on her screen have in common? The Tarot card represents self-limiting paralysis. The writer is a prime example of it in action. Or I should say, in inaction. Over the past few days, I’ve been having an ongoing conversation with my BFF Marina — a.k.a. The Divine Mrs. M — about my tendency to be my own harshest literary critic. It’s a never-ending loop of frustration that I’ve been having a hard time breaking out of for as long as I can remember. While I’ve been in Florida for the holidays visiting the fam, the Universe seems to have been on a mission to tell me to dump the self-doubt and get on with business of writing. Everything from fortune cookies to inspirational mugs has been popping up in my path shouting encouraging messages at me. There was even a full-length mirror covered in affirmations. They said things like: Create! Let your light shine out as you let the sunshine in. Imagine your dream! That brings me to my New Year’s resolution: In 2017, I’ve resolved that I’m going to learn to ignore my inner critic. I know it won’t be easy. I also know I can’t do it alone. I’ll need people to encourage me to stay psyched up with a can-do attitude — and to kick me in the can when I start backsliding and end up all psyched out and paralyzed by self-doubt. Luckily, I know some people who might be up to the task. Plus, I bought the mug (I figured it’ll be a lot easier to pack than that mirror). 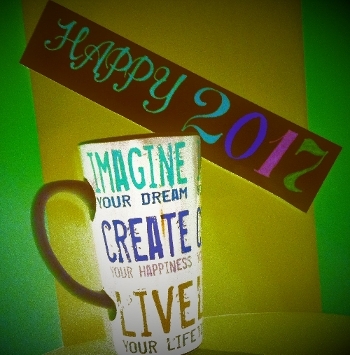 So what have you resolved to do (or not to do) in 2017? We’ve all been there. In the last year, I’ve realized “writer’s block” isn’t the inability to think of what to write next. It’s self-sabotage and procrastination rooted in fear. You have a stories that only you can bring to the world. And I’m guessing a little escapism and entertainment is going to be very welcome in the years ahead. Get to it! I’ll hold you accountable if you hold me accountable. Deal?